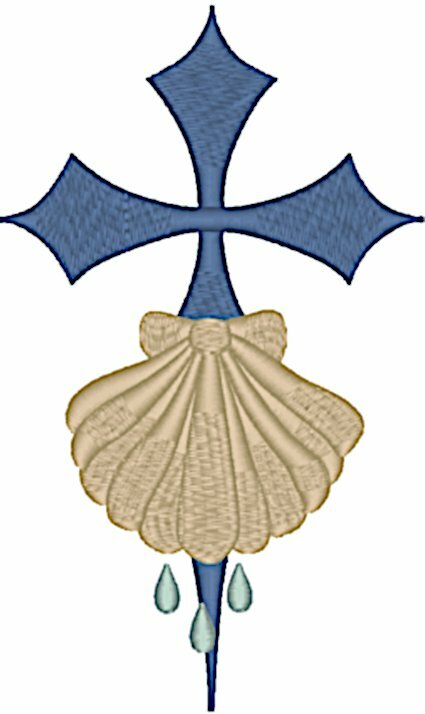 The St. James cross is an espada, a symbol between a cross and a sword. It was used during the Crusades to promote the Christian ideal of leading an evangelical life while fighting the infidel with arms. The shell is an ancient symbol of baptism and in early Christian art John is often depicted baptizing Christ with water poured from a scallop shell. The sewn out size for the 4" x 4" hoop is 2.24" W x 3.74" H with 4,822 stitches. The sewn out size for the 5" x 7" hoop is 4.06" W x 6.78" H with 14,187 stitches. The sewn out size for the 7.75" x 11.75" hoop is 6.88" W x 11.49" H with 38,249 stitches. Need it even larger? This design is also available for a 450mm x 475mm hoop in DST and EXP formats. Click here for more information on the Mega St. James Cross with Baptism Shell.